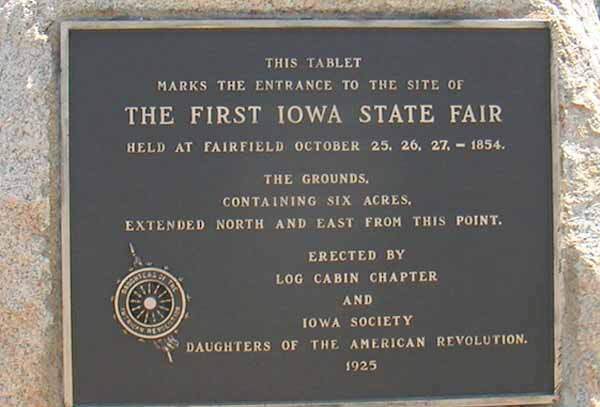 ⚫ The first and second Iowa State Fairs were held in Fairfield in 1854 and 1855. 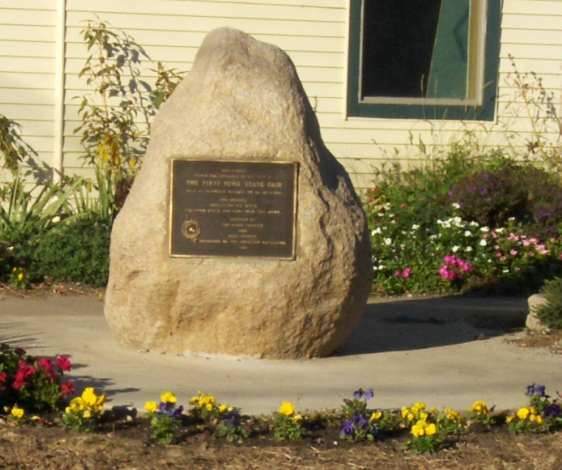 A stone marker on the corner of 4th Street and Grimes Avenue tells the story. William Louden attended as a boy. 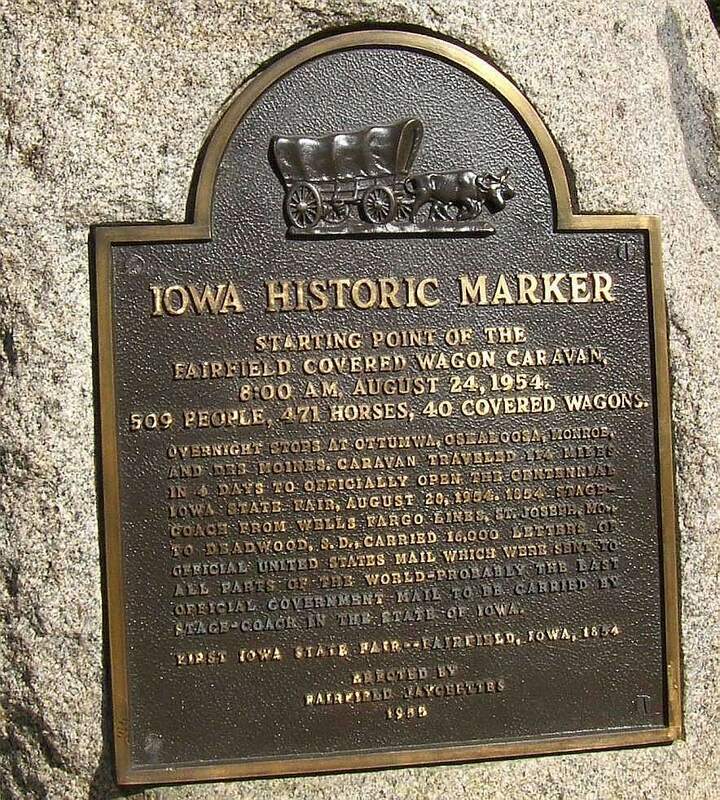 ⚫ Another stone marker, in the southwest corner of the Fairfield Square, tells the story about the 1954 recreated one-hundredth anniversary wagon train, which traveled from the original Iowa State Fair site in Fairfield to the present fair site in Des Moines. Another wagon train was again re-created in 2004. 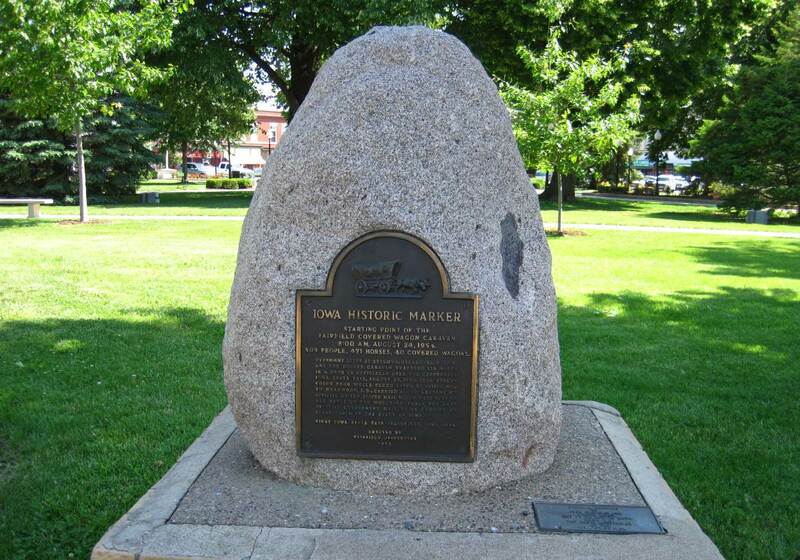 The Wagon Train marker in the Fairfield Square. ⚫ There are many Maharishi Sthapatya Veda designed houses in and around Fairfield, and in Maharishi Vedic City. The Maharishi Vedic City website is here. ⚫ You may want to look at Abundance Ecovillage on 185th Street. Their website is here. ⚫ For those interested in World War II machinery, you can see vintage Dodge Power Wagons at 302 S. 7th Street (on Washington Ave. between 6th and 9th Streets), or on their website. ⚫ Take a look at the restored murals in the Post Office lobby (built 1929) at the corner of West Broadway and 2nd Street. Scroll down to view the murals..
U.S. Post Office, West Broadway Ave at 2nd St.
One of 2 WPA murals in the post office lobby.